Background There is evidence to suggest that adherence with prescribed medication is lower amongst adolescents and children than in adults. Medication adherence rates between 11 and 93 % in paediatric patients have been reported. More research needs to be carried out in order to understand why medicines adherence is low and how adherence can be improved in children with long-term conditions. Personal communication with paediatricians in secondary care has highlighted that problems are most likely to be encountered by parents, carers, nurses and children themselves when administering medicines for prevalent long-term childhood conditions. Objective To explore problems with oral medicines prescribed to paediatric patients from the perspectives of medical practitioners, pharmacists and nurses. Setting Two NHS trusts in the West Midlands, UK. Methods Four focus groups (FG) were conducted. Five nurses, eight medical practitioners and six pharmacists participated in focus groups. The themes explored were problems experienced when prescribing, dispensing and administering oral medicines for children. Main outcome measure Themes evolving from Healthcare professionals reports on problems with administering medicines to paediatric patients. Results Two main themes: sensory and non-sensory emerged from the data. Included within these were taste, texture, colour, smell, size, swallowing, quantity, volume and manipulation with food. Taste was the most commonly reported barrier to medicines administration. Texture was reported to be a significant problem for the learning disability population. Medicines manipulation techniques were revealed across the groups, yet there was limited knowledge regarding the evidence base for such activity. Problems surrounding the supply of Specials medicines were discussed in-depth by the pharmacists. Conclusion Organoleptic and physical properties of medicines are key barriers to medicines administration. A robust scientific evidence-based approach is warranted to inform standardised protocols guiding healthcare professionals to support safe and effective medicines manipulation across all settings. Pharmacists’ knowledge of Specials medicines needs to be recognised as a valuable resource for doctors. 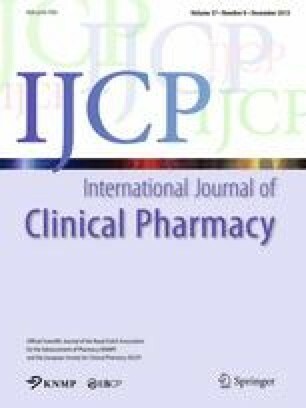 Findings of this study should help to optimise paediatric prescribing and direct future formulation work. We would like to thank all of the healthcare professionals for their participation in the focus groups. It should be noted that this study explored the reports of healthcare professionals, thus these may not be factually correct. We would like to also acknowledge the West Midlands Medicines for Children Research Network (WM-MCRN) for funding this research. WHO. Adherence to long term therapies: evidence for action. http://whqlibdoc.who.int/publications/2003/9241545992.pdf. Accessed 14 May 2010. NPSA. Information sheets & consent forms. Guidance for researchers and reviewers. Version 3.5 May 2009. http://www.nres.npsa.nhs.uk/applications/guidance/consent-guidance-and-forms/?esctl1417026_entryid62=67013. Accessed 13 May 2010. MHRA. Medicines that do not need a licence (Exemptions from licensing): the manufacture and supply of unlicensed relevant medicinal products for individual patients (‘specials’). http://www.mhra.gov.uk/Howweregulate/Medicines/Doesmyproductneedalicence/Medicinesthatdonotneedalicence/index.htm. Accessed 15 Feb 2012. EMEA Reflection paper: formulations of choice for the paediatric population EMEA/CHMP/PEG/194810/2005 2006. http://www.ema.europa.eu/docs/en_GB/document_library/Scientific_guideline/2009/09/WC500003782.pdf London. Accessed 1 Oct 2011. Smyth J. NEWT guidelines 2012. http://www.newtguidelines.com/AdminOfTablets.html Betsi Cadwaladr. Accessed 1 Jan 2013. EMA. 2013. http://nvkfb.nl/download/2013/Guideline%20on%20pharmaceutical%20development%20of%20medicines%20for%20paediatric%20use.pdf. Accessed 11 Mar 2014.